The November 2013 edition of our Fulbright New Zealand Quarterly newsletter is online now! 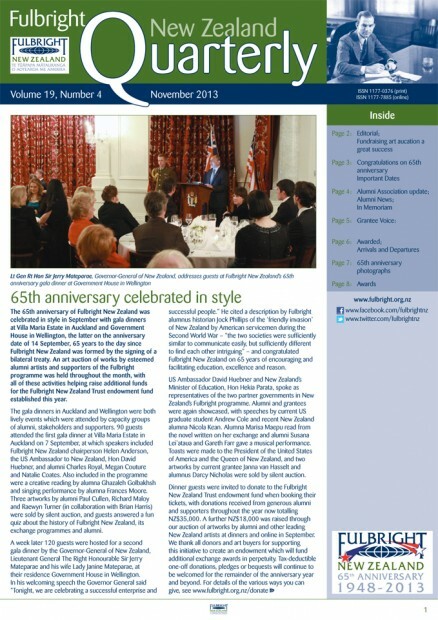 In this issue, read about our major 65th anniversary celebrations in September, including a successful fundraising auction of artworks by Fulbright alumni and supporters, and messages of congratulations from high ranking official representatives of New Zealand and the United States of America. Current Fulbright New Zealand Graduate Student Ani Kainamu reports on her exchange to the US, and we have the usual news updates from the Fulbright New Zealand office and the Fulbright New Zealand Alumni Association, details of our latest grantees, alumni news in brief, and a full list of available awards.